Contents. List of Contributors. Introduction to the Series (A.M. Tartakoff). Preface (B. Storrie and R.F. Murphy). Models of Endosome and Lysosome Traffic (R.F. Murphy). Endocytic Receptors (M.G. Roth). Functions of the Mannose 6-Phosphate Receptors (B. Hoflack and P. Lobel). Chemistry of Lysosomal Cysteine Proteinases (R.W. Mason and D. Wilcox). Mechanism and Regulation of Autophagic Degradation of Cellular Proteins (W.A. Dunn). Cell-Free Systems for Endocytosis (W.A. Braell). 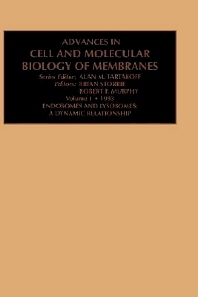 Genetic Analysis of Membrane Traffic in Mammalian Cells (P.A. Colbaugh and R.K. Draper). Plasma Membrane Lipid Transport in Cultured Cells: Studies using Lipid Analogs and Model Systems (M. Koval). Endosomes, Lysosomes, and Trans-Golgi-Related Systems in Conventional Neurons and the Frog Retina: Shards and Suppositions (E. Holtzman, E. Augenbraun, R. St. Jules, and M. Santa-Hernandez). The Role of Endocytosis in Epidermal Growth Factor Signaling (B.K. McCune, W.R. Huckle, and H. Shelton Earp). Membrane Traffic through the late Stages of the Yeast Secretory Pathway (E.A. Whitters, H.B. Skinner, and V.A. Bankaitis). Regulation of Lysosomal Trafficking and Function during Growth and Development of Dictyostelium Discoideum (J.A. Cardelli). Towards an Understanding of the Inheritance of Mammalian Lysosomes and Yeast Vacuoles (B. Storrie). Index.